VMfitness: On a Quest: Oh the Possibilities with PastaBilities GIVEAWAY & Vine! 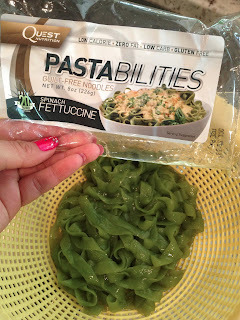 On a Quest: Oh the Possibilities with PastaBilities GIVEAWAY & Vine! Hehe - jumped on the bandwagon. 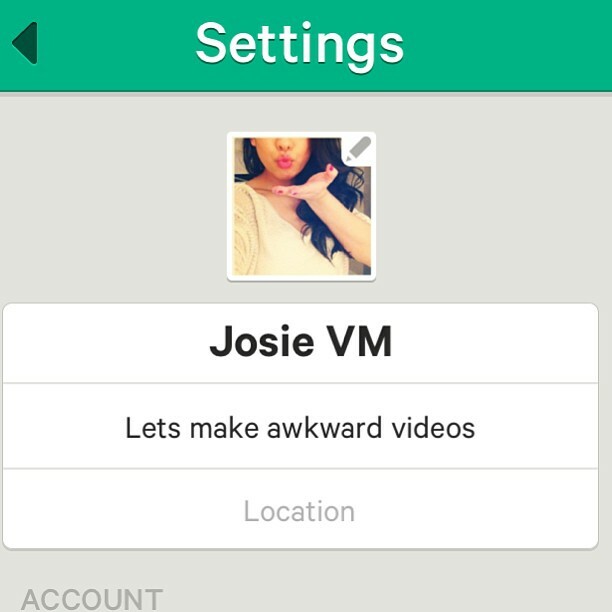 Search JOSIE VM! <3 <3 get ready for some awkward videos YAYY! Uhm can you say HECK TO THE YEAH! I was sent 2 types of pastas: spaghetti and a Spinach fettuccine! Seriously, I love QUEST for their protein bars and rave about them all the time, so I was so excited to see how this new product would taste! 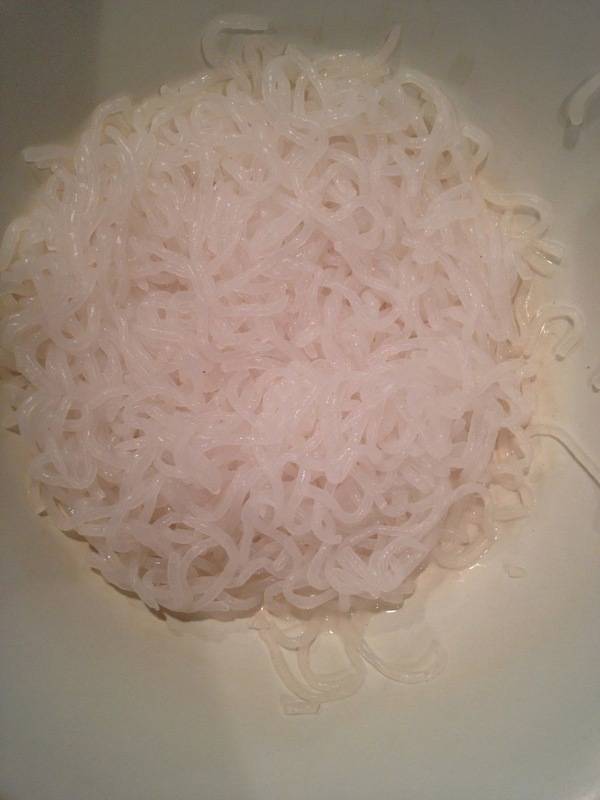 Especially in comparison to other similar pastas like Miracle noodles, shirataki noodles, and the like! Here's some FAQ about their new Pastabilities! What are Pastabilities made out of? Quest Pastabilities are made from Konjac root, also known as Glucomannan. Konjac root has been eaten for hundreds of years in Japan and other Asian countries. Many love Konjac root for its hunger reducing properties. While containing very few calories, the noodles leave you full and satisfied! Why do Pastabilities make you feel full? Quest Pastabilities consist of 100% soluble fiber. That is why dieters have used Konjac noodles whenever they want to feel full without consuming the calories and carbohydrates that come with regular noodles. By themselves, Quest Pastabilities don't have quite the same consistency as regular noodles, they are slightly more chewy than al dante pasta. 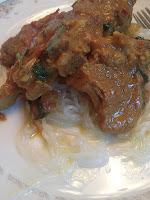 After applying sauce most people find them to be very close as the noodles take take the flavor of whatever sauce you apply. What's the liquid they come in? 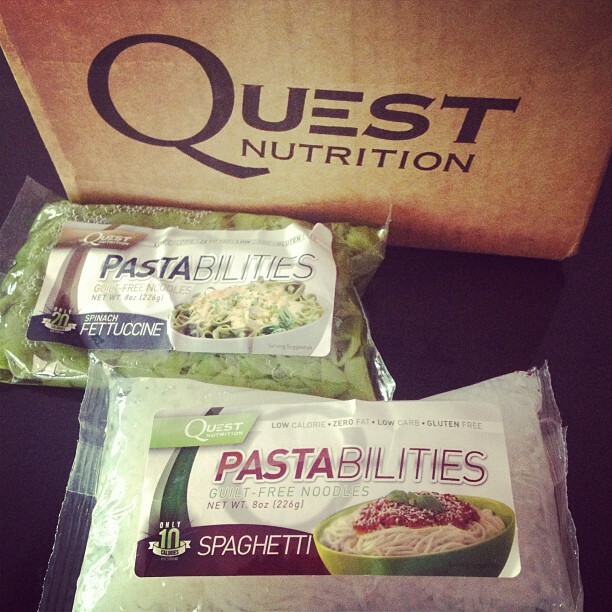 Quest Pastablities are packed in alkaline water to ensure freshness. I've heard the uncooked noodles have an ocean scent, is that true? The alkalized water does have a scent. This protects the noodles for you and is quickly and easily removed when you rinse and strain the noodles. Once cooked it is completely removed. Just rinse the noodles in a strainer to remove the water then flash boil for 1-2 minutes. After that, apply your favorite sauces and toppings and enjoy! Not only is it better for you than normal pasta, it's also easier to cook! So net carbs are ZERO because you subtract the dietary fiber! NICE. Zero fat, gluten free, low sodium, low calorie. Uh... PERFECTTTTT pasta substitute. So I opened this bad boy up and yes, there is a fishy ocean scent, like other no carb noodles, but like the FAQ said, it's used to protect the noodles. Just make sure you rinse the noodles veryyyyy very very well so that you can get that smell out! The noodles are also quite long, so I recommend cutting them with some scissors. Flavor: The noodles basically soak up the flavors of whatever you're cooking it with! When I had mine, I ate it with a goat curry dish that my dad made, and it basically just tastes like the sauce that I was eating it with! No fishy or ocean taste at all! AWESOME. I know some other noodle alternatives still hold on to that fishy smell and taste. If you're scared of that happening, just make sure you cook your noodles well before serving! Boil them or microwave them a little longer, or let them cook with your food for a bit to really soak in that flavor. It says it serves 2, and the spaghetti has only 10 calories per serving, so because it was so low calorie, I just ate the whole pack! And it actually did fill me up! For the spaghetti, I cooked them with the microwave instructions - rinsed very well, cut, and microwaved for 1 minute. Again, rinse very well, cut the long noodles, and this time I cooked them in a small pot with some cheese and broccoli in an attempt to make broccoli cheddar mac n cheese soup.. the recipe was a bust haha but the noodles were still good! I tried some on its own and the spinach flavor wasn't very strong, but it was a thicker noodle than the spaghetti so if you like more to bite into, then these would be a better choice. I wouldn't recommend these noodles for mac and cheese because of the texture. It's more bouncy and chewy than harder al dente mac n cheese pasta. I recommend these noodles more for like meat dishes, or soups, or healthier pho, chicken noodle soups, or healthier ramen/cup noodle alternatives! I DO like these noodles. They're a great very low cal, zero carb, gluten free alternative to higher calorie and processed noodles out there which is great for us with the healthy lifestyle! 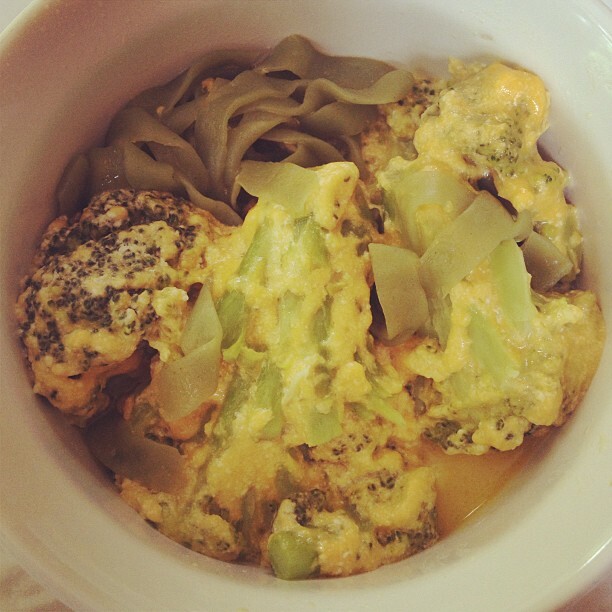 In comparison to all the other low carb pastas out there, this is probably my fave because it DID fill me up. I was filled and satisfied, where for other pastas I've tried, I actually got hungry again within the hour! It also has less of a fishy smell/taste after cooking of course, compared to other noodles. These are a GREATTT choice for anyone on comp prep who miss noodles, because they have the same noodley consistency, and are so low cal and low fiber! Also great for anyone that misses pasta but are gluten free or celiac or sensitive to gluten! I plan on stocking up on a few more to try and bang out some ramen/cup noodle/pho recipes for you all in the future! There will be 4 winners and each will receive 1 Spaghetti and 1 Spinach Fettuccine! Instagram: Just repost the picture that I posted about the giveaway and you'll be entered into the random drawing! Every repost will equal an entry! Comment Here! : comment below what you would use these noodles for! Each comment will be an entry into the raffle! I am the ultimate carb addict. After years of binging, I am always trying to find healthy substitutes to the foods that often trigger me to binge. Hopefully getting these noodles will allow me to try something new and assist in my new healthy non-binging lifestyle! I love the fact that it's healthy and low calorie. I would definitely try to come up with cool recipes with these noodles, particularly an alfredo version! congratulations Ruby! You're one of the winners for the quest pastabilities giveaway! i've always wanted to try this! i am all about quantity eating. i saw a healthy version of a chicken alfredo i would love to try with these! Nice post..I have gone through your blog. The information you have given are really informative. Thanks for sharing the post. I love Nasoya Pasta Zero. This stuff sounds similar. I'd use the fettuccine to make a pasta dish with Quorn meatballs and mushrooms! Yum!!! I would make a clean Chicken Primavera with summer squash with the spaghetti and the texture sounds just right for a Spinach fettuccine Pad Thai! Very interested to try these for baked spaghetti and other pasta dishes. I avoid pasta because I tend to go WAY overboard on it. This would allow me to have the food I like again and it sounds like help me stay in check! Awesome information on review and will definitely experiment with tons of flavors if I win! Pasta is probably the number one thing I miss going bonkers over since changing my eating habits and have yet to find a good alternative so I would LOVE to make you and Quest Nutrition proud and come up with awesome dishes. I'd love to try these! I have a tough time with carbs, so this would be a great, new option for me! So exciting that Quest came up with these! I've eaten other similar noodles sold in Asian stores and am very curious to try these to see how they compare. I'm looking for something with a bit more texture than the angel hair type I've tried. I have been struggling for a very long time with the extra baby weight and have decided to "cheat clean" with the Quest bars which I really like. I do love my carbs and while these pasta substitutes scare me, I really want to make a lifestyle change and am hoping that I can convince my husband to do the same. I want to be there for my young daughter and making small changes is the only way. Hopefully I win this competition so I can try this product! I am starting this new beginning of low carb, I am really worried about satisfying my carb hunger however, I love love pasta so I came across the new pastabilities and thought they might foot the bill for my cravings. I really hope I win your samples and samples of your bars as I am recently widowed and low income so I only buy what I know I will eat but I decided it was time for a change and get this fat off my body. Thank you so much for reading! !